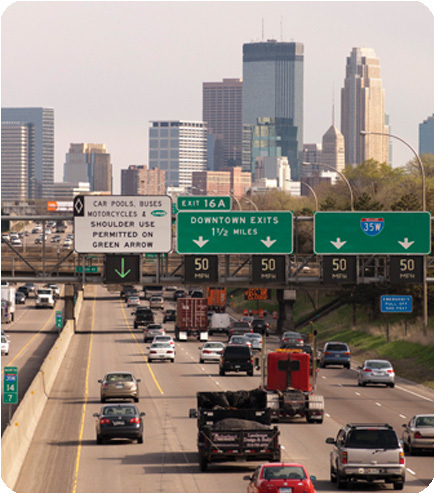 Although the verdict on the system’s effects on I-94 congestion is still pending, a recent study by researchers at the U of M’s Minnesota Traffic Observatory (MTO) found that the VSL system has not made a measurable impact on crashes in a crash-prone stretch of freeway in downtown Minneapolis. Why not? John Hourdos, MTO director, has a few theories. According to Hourdos, issues include a simple time lag in the VSL system, a requirement that all lanes display the same speed limit, and the complexity of the I-94 commons area itself. In addition, the driving public simply doesn’t understand what the signs are telling them. Hourdos says many motorists mistakenly believe the speed displayed on the signs is either a reflection of the speed on the current stretch of highway or an indication of the speeds on the highway ahead, rather than a suggested speed for them to follow. The requirement to display the same speed limit on all signs also compounds the problem, Hourdos says. When drivers see that the slowdown is only occurring in certain lanes, they tend to ignore the signs altogether. So is the I-94 VSL system useless? Not necessarily. For one, the new study didn’t measure the system’s impact on congestion—only its ability to reduce crashes on a small portion of I-94. Moreover, the area in question, the I-94 commons, is fairly unusual, having two major bottlenecks, the highest crash rate in the state, and five hours of congestion during the afternoon rush hour alone. “The VSL system was designed for implementation on any freeway and may not have been well-suited for the I-94 commons area, which is a very complex corridor with high-volume weaves and significant shockwave activity,” says MnDOT freeway operations engineer Brian Kary. But MnDOT and the MTO researchers aren’t giving up. A new project starting this year is focused on developing and deploying a queue warning system specifically for this location (see article in the May 2014 Catalyst for details).